Few of us know when our northern Irish surnames came into existence or how some long-forgotten ancestor acquired it. Indeed history books say that the oldest surname anywhere in Europe was in Galway in the year 916. That makes it over one thousand years-a long way back. Many times we don’t know the history and yet aren't we proud of our surnames. This is particularly true where a surname can denote religion, place of origin and political outlook. It is widely believed that there are two kinds of surnames in Ireland: those from native Gaelic families, and those brought to Ireland by settlers from England and Scotland. By the 11th century it is widely believed that the surnames we have today were used. Ireland has a variety of Irish surnames, indeed Irish Clans which reveal numerous migrations of peoples over the centuries. This emerged during the 11th century, as the population increased and more than one person with the same name lived in the same area. At first the surname was formed by prefixing Mac, ('son of'), to the father’s Christian name, or O, ('grandson'), to that of a grandfather or earlier ancestor. Mac an Bhaird, ('son of the bard'). In other cases the name denoted a particular feature or peculiarity of the grandfather or father. Mac Dubhghaill ('black stranger'), modern MacDowell, or a nickname was adopted, such as Mac an Mhadaidh-mada, meaning 'dog' (now MacAvaddy). Traceys (Ó Treasaigh) was maybe a formidable character, treasach meaning "war-like", while the ancestor of the Duffs must have been dark-featured, since dubh, the root of the name, means black or dark. The Anglo-Norman invasion of the twelfth century was the surname origin of Irish last names such as Cruise, Dillon, Nugent, Power and Roche, which have become 'exclusively Irish' over the centuries. In south-east Ulster, where The Normans formed a strong community in Co Down, northern Irish names including Hackett, Russell, and Savage remain associated with that part of the country to this day. The mass migration which occurred during the 17th century government-sponsored Plantation scheme was to have a massive impact on Ulster. The surname origin of English surnames such as Bingham, Mitchell, Shaw and Turner are just some examples of derived northern Irish last names commonly found in northern Ireland. Many of these came to Ulster with settlers from Cheshire, Lancashire, Yorkshire and Westmoreland who tended to favour settlement along the Lagan valley. Scottish settlers, mainly Presbyterian, had migrated to Ulster before the Plantation and in greater numbers, throughout the 17th century. They brought with them the Irish surnames such as Agnew, Adair, Shaw and Maxwell. Less well known is the number of Welsh settlers who had migrated to Ireland long before records began. Branagh, Lynnott and Joyce are evidence of Welsh migration. Settlers from many parts of the world have fled to Ireland over the centuries because of persecution. The Huguenots fled France in the 17th century, settling in many parts of Ireland. They made a major contribution to the development of the linen industry in Ulster and brought Huguenots surnames, such as Alderdice, Latour, Ricard and Duprey. 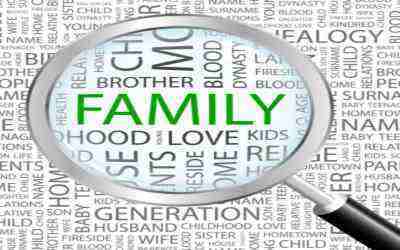 In our small country where family ties remain strong and many are still acquainted with our first, second and third cousins, family history is becoming an increasingly popular pastime. Tracing a name can allow us to see both ourselves in a new light and reveal a much more complex picture of Irish society than the history books would suggest and ancestry.co.uk can be a useful guide.